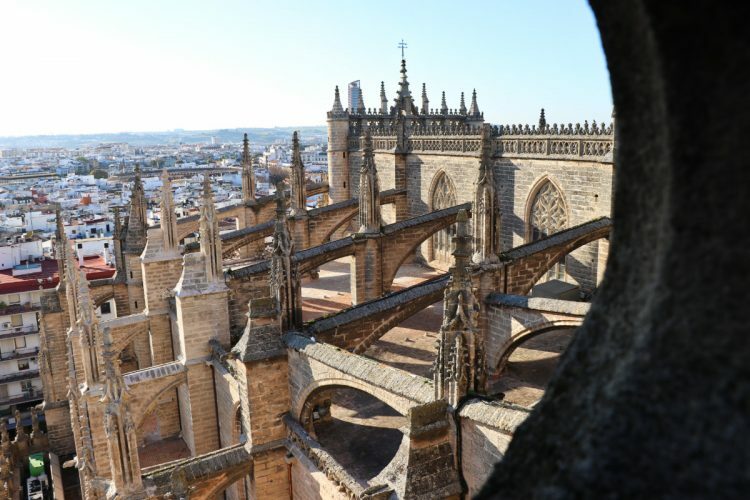 Tours of the roof of Seville Cathedral do not only give fantastic views of the city but also a close-up look at the architectural details of the world’s largest Gothic church. 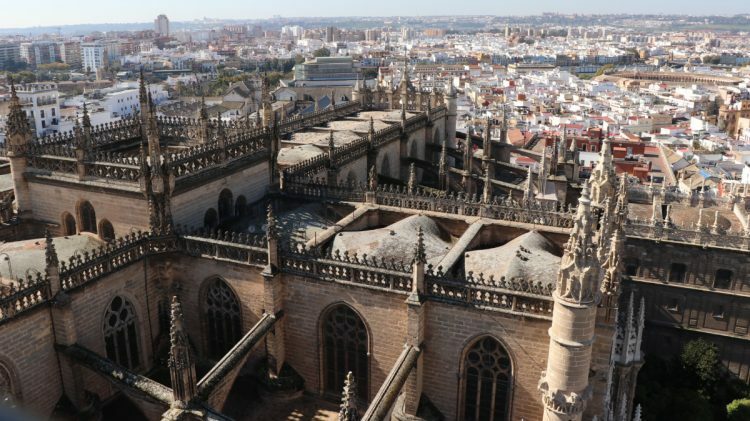 A fun way to make a visit to Seville Cathedral more interesting is to book the surprisingly cheap roof tour. 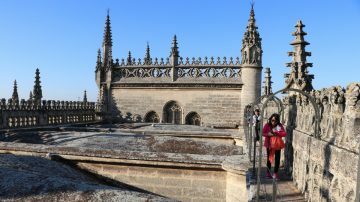 Rooftop tours give visitors close-views of the gargoyles, flying buttresses and architectural details of parts rarely seen when visiting the largest Gothic church in the world. 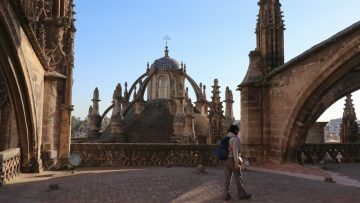 From the roof of the cathedral visitors also enjoy spectacular views of the Giralda bell tower, the Real Alcazar palace complex and the surrounding area of historic Sevilla. The rooftop tours are only offered by the cathedral itself and thus add only a relatively small surcharge to regular admission tickets. Book online and in advance. 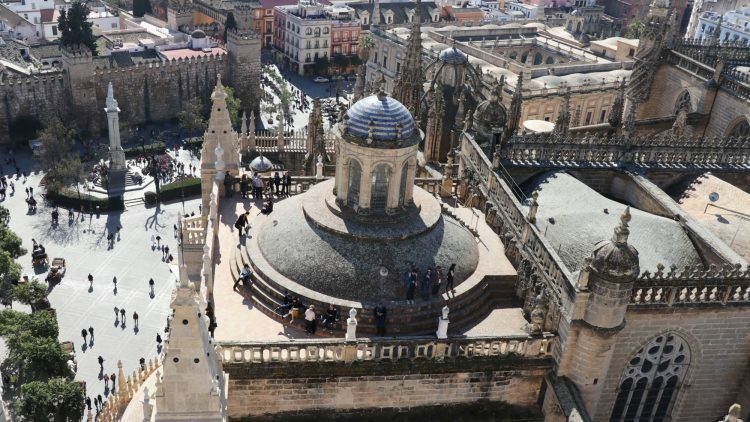 Many tours are available for the interior of Seville cathedral but the special rooftop tour is the only opportunity to get close to the architectural details on the roof of the church that most visitors never get to see. For medieval builders, the roof of the church was closer to God above and thus just as important to look good than the interior decorations. 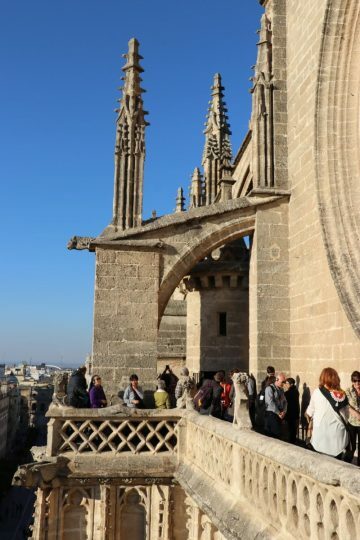 During the 90-minute tours, visitors go up to the roofs and domes of the cathedral accompanied by tour guides that are specialist art historians or technicians working in the cathedral. The ascent to the roof is in stages and no climbing other than several flights of stairs is required. Seville Cathedral is a very late Gothic construction, which allowed the builders and artisans assembled from all over Europe to combine years of experience and knowledge to construct the largest Gothic church ever at remarkable speed too. The main building was erected between 1437 and 1517. On the tour, visitors go from the church interior up spiral stairs to the roofs of the chapels, which are around 14 m above street level. Here, the sides and corners of vaults were filled in using broken pots and earthenware to create a flat floor that could be used as building platform for the higher central nave and transept. 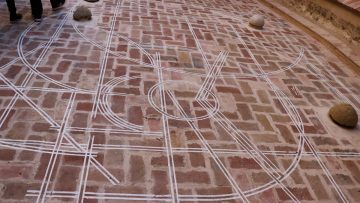 Numerous template marks survived showing how the master builders created details on-site. A close-up view of the flying buttresses illustrates how these not only support the church but also transport water safely from the roof towards the gargoyles from where it spews safely away from the church walls. Seville Cathedral also seems to have endless pinnacles — glorious stone peaks approaching the sky and heaven but which are primarily essential for deflecting the thrust forces exerted by the domes downwards to the ground. Although Seville Cathedral is predominantly Gothic, other architectural styles were also used. The vestries and chapter house on the south side are Renaissance (1528-1621). The dome and lantern of the Main Vestry impress with its own elaborate flying buttresses while Hernan Ruiz found a simpler solution for the smaller elliptical dome of the chapter house. 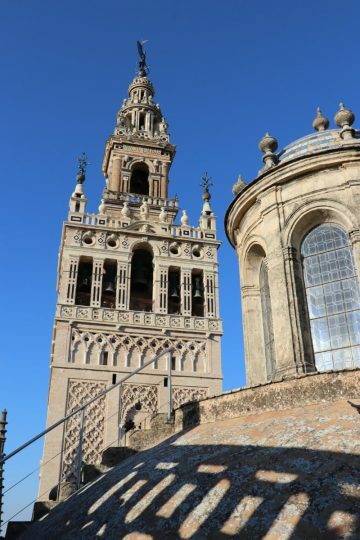 The views over the city of Seville are superb throughout the whole tour but the best views are certainly of the Giralda bell tower from the roof of the Renaissance Royal Chapel dome. From here visitors enjoy an unsurpassed view of the elaborate details of the decoration of this magnificent tower — the side facing the church was recently restored and clean and is thus currently in as-new condition. The Giralda was originally the minaret of the Almohad mosque and became the bell tower of the catholic church. The tower remained largely unaltered for decades even after the Gothic church was completed. 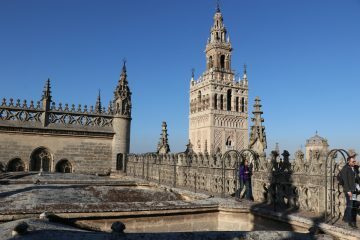 The lower 51 m are the original Ben Basso Moorish minaret erected in the 12th century but Hernan Ruiz added the upper half with balconies and belfry in the late 16th century. The viewing platform with bells is at 70 m while the total tower is around 96 m. The Giraldillo weather vane symbolises faith victorious — it is the original from 1558; a copy is on display outside the main visitors entrance to the cathedral. It gave the tower its name — “girar” means “to turn”. The walk from here to the western end of the cathedral reminds of the huge size of this Gothic cathedral — at 126 by 83 m it is bigger than a football field. The heights are impressive too: 14 m above street level for the chapels, 25 m for the lateral naves and 36 m for the central nave and transept — even higher at the crossing but no walking on there! On the way down, visitors get a close up view of the oldest gargoyles and the 9-m Rosette on the western facade — it is really made to be seen from the inside. The relative simplicity of the Parish Church of the Tabernacle confirms that the main purpose of a Baroque church building is to prevent the glorious interior from falling apart. 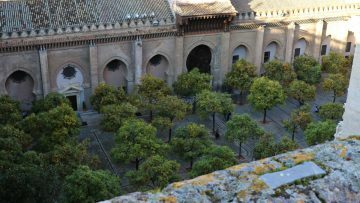 More interesting is the view of the Patio de los Naranjos that survived from the Moorish Almohad mosque and the Mudejar horseshoe-shaped Puerte del Perdon. Tours of the roof of Seville Cathedral are only offered by the cathedral itself and are therefore relatively cheap. These tours are generally offered only a few times per day and groups are kept fairly small. Online reservations are easy and highly advisable. Roof tours may also be booked at the normal ticket window but that is risky, as tours often sell out well in advance and queues are often very long. Names are currently sufficient at the start of the roof tour but a print out or mobile phone barcode is required for entering the cathedral and Church of Our Saviour later on. Be outside the appointed door on time — currently Puerta de San Miguel in Avenida de la Constitution. It is impossible to catch up with the tour later, partly as no one will be available to open the door once the tour has begun. Daily tours are offered in either Spanish or English and occasionally in French, Italian or other languages as well. Visitors receive audio pieces — own earphones may be used — which have the advantage of not only being able to hear the guide clearly but also allow tour members to move around a bit at the different stops and not gather around the guide the whole time. A similar tour of the stained glass windows — thus also high up but inside the church — is occasionally available but far less often than the roof tour. Conditions are basically the same but unfortunately no discounts are given on cathedral entry for booking both. The roof tour is suitable for visitors of all ages 10 years and up — although the accident insurance automatically included in the tour price only covers visitors up to 70 years old. See also Visiting Seville Cathedral for more on this magnificent church and Buying the Cheapest Tickets for Seville Cathedral for more tips on tickets and tours.